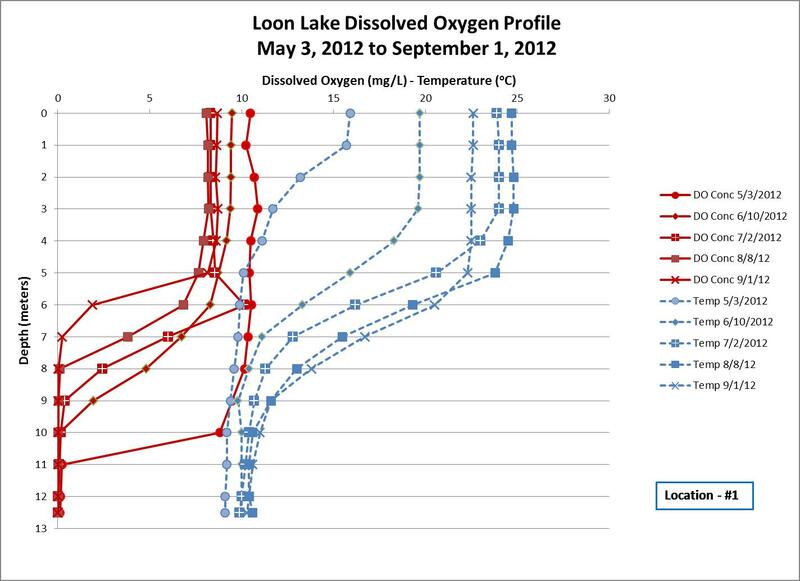 Depicted below is a summary of the dissolved oxygen (DO) testing for 2012. It includes the results from the East Basin, which demonstrates the summer stratification phenomenon, as well as sampling results from various shallow areas around the lake. This graph is a little congested, but if you follow the legend you’ll see water temperature increasing and DO levels at the surface falling. Also we’re seeing a more anoxic state at the lake bottom. Water temperature at the lake bottom is staying quite stable. The thermocline stabilizes between 5 to 7 meters, creating a thermal barrier (due to the density of the water) that prevents the mixing of the waters of the upper and lower lake. Unfortunately, DO sampling was not done late in the fall, so we were not able to track the profile as the lake “turned over.” Winter sampling on the lake was also not done, but we hope to include that in upcoming years. 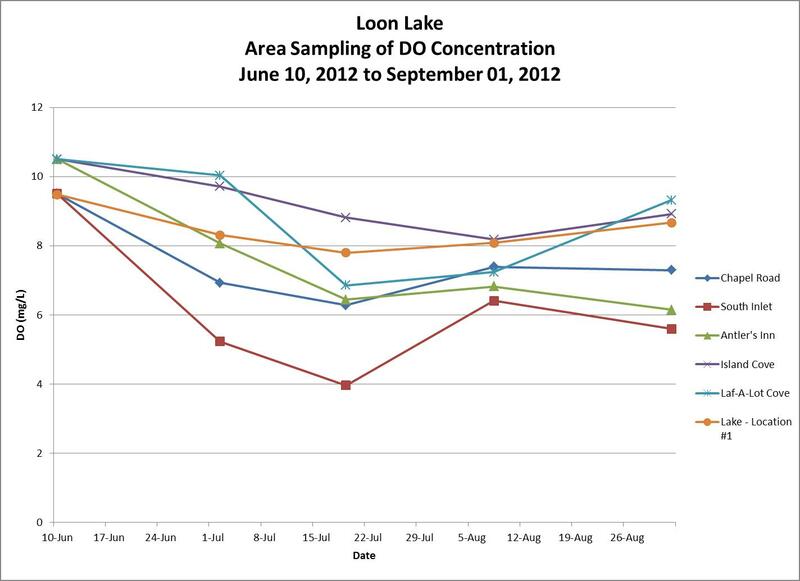 This chart depicts DO concentration at a number of shallow areas around the lake (see chart in the DO Sampling Protocol section). A number of readings were taken at a depth of approximately one meter and the results shown as an average of those readings. For reference, the orange line (Lake – Location #1) is the reading obtained at the East Basin at the one meter depth, so you can see how DO concentrations vary in relation to the lake in general. For the most part, the shallow area readings are below (and sometimes, well below) the general lake readings. This can be attributed to the biological and chemical consumption of oxygen in these highly fertile areas. Remember, these readings were taken around dawn. Sampling of the same areas in the afternoon showed DO concentrations 1 ½ to 2 ppm higher as a result of photosynthesis.